The oldest book in the Lenhardt Library's rare book collection has a special name, and we even know its birthday. Entitled Historia plantarum, it is the first great botanical work published by the ancient Greek polymath and Aristotelian student and successor, Theophrastus (371–287 B.C.). Treviso, located in northeastern Italy, is an ancient city, with historic ties to Venice dating back to the fourteenth century. It is perhaps best known today as the headquarters for a number of important corporations, most famously Luciano Benetton's brand that generates billions of Euros. In the fifteenth century, some of earliest printers in Italy set up shop to take advantage of Venetian connections and a robust mercantile class. The earliest known arithmetic text, Arte dell'Abbaco, better known today as the Treviso Arithmetic, was published in 1478. It was designed to educate young individuals interested in basic mathematical applications in commerce. This book certainly indicates strong business links between Venice and Treviso, with the earliest publishers in Treviso responding to the needs of neighboring Venice, as well as the demands of the rest of Italy. Theophrastus's Historia plantarum was largely unknown in Europe before the appearance of this editio princeps (first printed version of a work known only in manuscript form). This Latin translation of a Greek manuscript, originally preserved in Constantinople, was the work of Theodorus of Gaza (1398–1475), a scholar who single-handedly launched a revival of interests in the Renaissance in Latin and especially Greek literature and manuscripts. His formidable skills were recognized by Pope Nicholas V (1397–1455), a bibliophile in his own right. 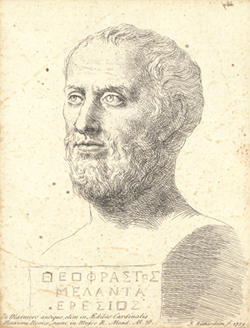 Theodorus arrived in Rome in 1449 and was part of Pope Nicholas's scholarly circle by 1452, working on translations into Latin of Aristotle and Aristotle's colleagues and students, such as Theophrastus. As Anna Pavord noted in her fabulous book The Naming of Names: The Search for Order in the World of Plants, Theophrastus created the first classification of plants, dividing plants into four broad categories: trees, shrubs, subshrubs, and herbs. His work was based on what we might call today the gross anatomy and characteristics of plants, devoting much of his work to trees. Theophrastus's work is significant, given that he was creating his classification without benefit of basic instruments, like a hand lens or microscope, or even a descriptive taxonomic language. As Pavord points out, Pliny the Elder (23–79) borrowed a great deal from Theophrastus for his Naturalis historia. It was Pliny who was remembered and copied in the long Middle Ages with his combinations of facts and fables in his natural history encyclopedia, while Theophrastus, the first real botanist, slipped into obscurity (except among scholars and their libraries in the Middle East). Shown above are the last two printed pages of Theophrastus's Historia plantarum, published in Treviso by Bartolomeo Confalonieri. At the bottom of the last page appears the colophon, indicating the completion of printing on 20 February 1483. Notice the ink hand added by some early reader pointing in the margin to the colophon. This image is from the Chicago Botanic Garden's copy of this work. These concerns over the veracity of Theodorus's interpretation of Theophrastus may have induced Georgio Merula (1430–94) to edit this volume. Merula was a recognized scholar in Venice, and probably was brought into the picture by either Rome or publisher Bartolomeo Confalonieri to specifically address the manuscript on hand in advance of publication. We do not have detailed records of Confalonieri, Merula, or Theodorus to consult on this matter. The published work itself is unlike any modern book, lacking a title page, page numbers, index, or table of contents. Its organization is more akin to the original Greek manuscript, with spaces created at the start of each section for an illuminator to add a decorative initial. Unfortunately, no one could afford these kinds of decorations, so these initial blanks remain vacant. No illustrations are found in this book (except for some scribbles in the margins and some drawings by a bored student centuries later on a once-blank page at the start of the book). Catalogers and other librarians left faint traces in pencil. In terms of provenance, this book was once part of the personal library of Albert Cameron Burrage (1859–1931), businessman, orchid specialist, and former president of the Massachusetts Horticultural Society. Burrage's library eventually became part of the Horticultural Society's Library on Massachusetts Avenue in Boston. A little over a decade ago this book arrived in Glencoe, Illinois, where I personally escorted the book on its trip to its then-new home at the Chicago Botanic Garden. It is the only copy of this particular edition in any library in the Chicago area. This editio princeps is as exciting to me today as it was when I first touched it, because all taxonomy of plants starts with this modest book. Centuries later, Carolus Linnaeus (1707–78) created the basic modern taxonomy that we use today. However, it was this work that caused many in the Renaissance to look at plants in different, and certainly not medieval, ways. It is no wonder that this book, the oldest in the Garden's collection, is also one of the most intellectually, and even emotionally, significant creations in the rare book room. It is the printed catalyst for modern thought on the natural world.